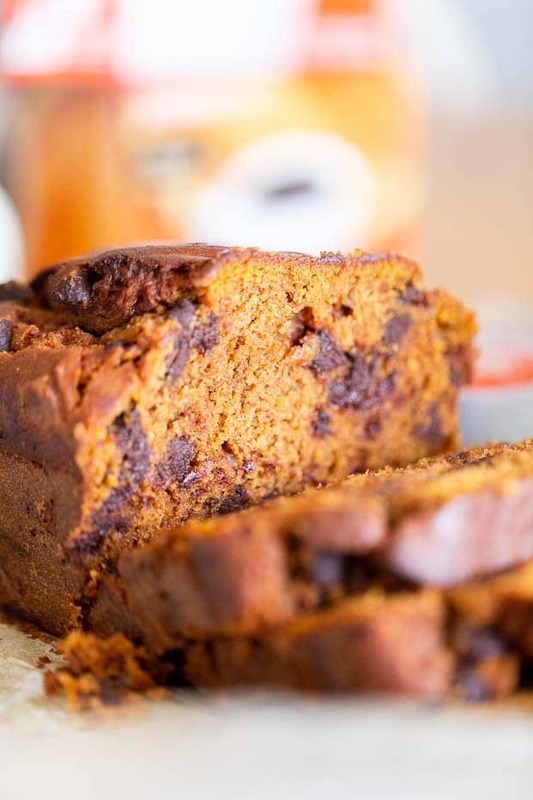 This easy, moist, homemade pumpkin chocolate chip bread is delicious! 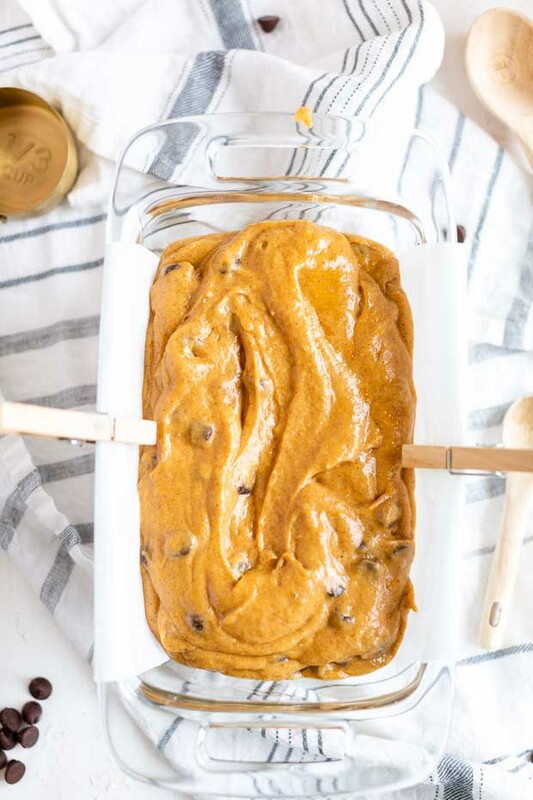 This easy, moist, homemade pumpkin chocolate chip bread is absolutely delicious! Here in Michigan, it’s finally almost my very favorite season: fall. And autumn in Michigan is magical. The trees change to vibrant, beautiful colors. 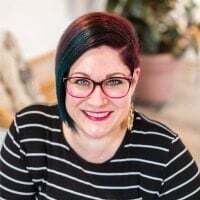 When the leaves fall, the create the most amazing crunch underneath your feet while you walk — your feet that are wearing warm socks and darling boots, by the way. I get to break out the cute sweaters and scarves. There are trips to the orchard where we enjoy hot, fresh donuts and sweet cider and pick out the perfect pumpkin. There are delicious pumpkin flavored treats everywhere, too. I love me some pumpkin! There are Friday night football games and backyard bonfires with friends. And the baking. Oh, the baking. Fall has always been my favorite time to create in the kitchen. Having a warm treat to enjoy is so cozy and filling. Naturally, when I start baking in the fall, many of my recipes revolve one of my favorite foods: pumpkin. 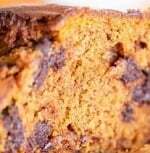 This pumpkin bread with chocolate chips combines a couple favorites for me — I find it’s best when served with a steaming mug of coffee. I’ve always enjoyed baking — it’s a hobby that started at an early age for me. I spent my childhood perched on the counter at my Nannie’s house, helping her mix and taste her incredible creations. As an adult, the passion has continued. Now, my boys pull up a stool and help me out, just like I did with Nannie when I was little. I love our time together as we work. There are always great giggles and conversations as we measure and stir. It’s great quality time for all of us. And of course, there is always the promise of an amazing treat to gobble up when we’re done working. 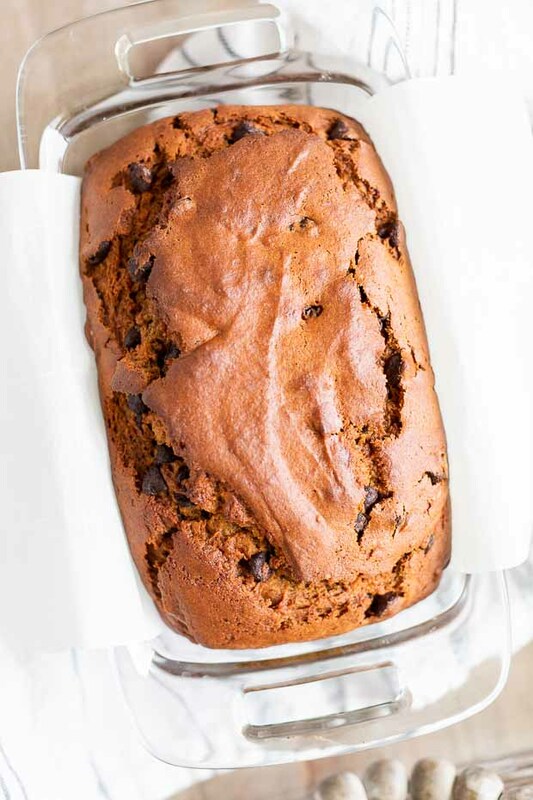 So let’s talk about this chocolate chip pumpkin bread recipe. One thing I love about this easy loaf bread recipe is how simple it is to make yet delivers the best flavor. Let’s gather the ingredients needed. We’ll use all-purpose flour, baking soda, ground cinnamon, ground nutmeg, ground cloves, salt, eggs, granulated sugar, light brown sugar, pumpkin puree, vegetable oil, orange juice and semi-sweet chocolate chips. I’ve also added banana, zucchini, pecans or walnuts to this recipe before as well. It’s yummy with those additions, too if you’d like to try experimenting. I always enlist my boys to assist in the kitchen. They help gather the ingredients I holler out and then we all assume a station at the counter. My youngest two are all about being able to take turns with measuring, pouring and stirring. You’ll start this recipe at the oven — definitely a mama job! Adjust the oven rack to the lower third position and preheat the oven to 350 degrees F to prevent the bread from browning too soon. Spray a 9”x 5” loaf pan with non-stick spray. Set aside. In a large bowl, whisk the flour, baking soda, cinnamon, nutmeg, cloves and salt together until combined. In a medium bowl, whisk the eggs, granulated sugar, and brown sugar together until combined. Whisk in the pumpkin, oil, and orange juice. Pour these wet ingredients into the dry ingredients and gently mix together. Be sure not to over mix – there will be a few lumps. Gently fold in chocolate chips, being sure to taste a few. Pour the batter into the prepared loaf pan. Bake for 60-65 minutes, making sure to loosely cover the bread with aluminum foil halfway through to prevent the top from browning too much. Insert a toothpick into the center of the loaf – if it comes out clean with just a few crumbs, it is finished baking. Allow the bread to cool completely in the pan on a cooling rack. You can store it in an airtight container for up to 10 days or in the freezer for up to three months. You could also make these as muffins instead of a loaf. You’d use the same recipe and divide the batter into a greased muffin pan and baking for 17-20 minutes at 350 degrees F.
I slice up the pumpkin chocolate chip bread nice and thick and serve it on a pretty dish with our mugs of coffee. It’s the perfect reward for a day spent working hard. 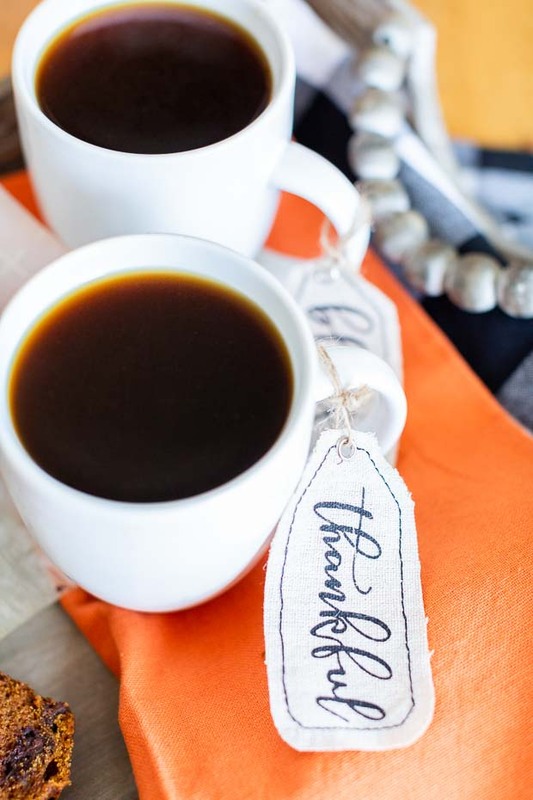 The chocolate and pumpkin are the perfect compliment to each other. There are few things as satisfying as warm bread. I hope your family will enjoy this pumpkin chocolate chip bread as much as we do. The bread will stay fresh in an airtight container at room temperature or in the refrigerator for up to 10 days or in the freezer for up to 3 months. Simply thaw overnight in the refrigerator and bring to room temperature before serving. Use this same recipe to make muffins by simply dividing the batter into a greased muffin pan and baking for 17-20 minutes at 350 degrees F.
This combination in a bread is so good! I have a similar recipe that I have been making every Fall for over 30 years. Mine doesn’t have the OJ though. I might have to try this to see what the difference is! Great fall pumpkin dessert! 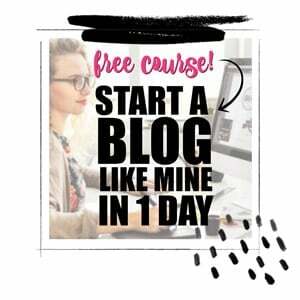 Sounds fabulous! Sharing! Thank you for sharing on Merry Monday! Hope to see ya next week! This is such a great dessert. 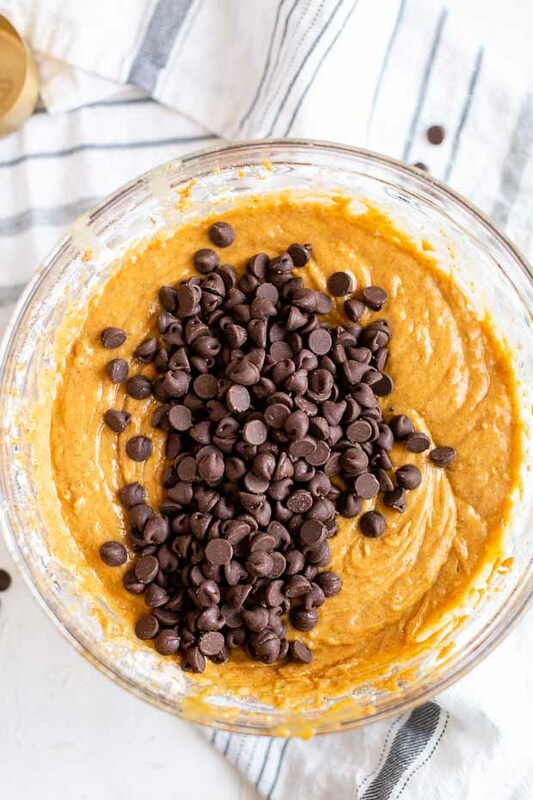 It combines two of my favorite things, pumpkin and chocolate. So good.